Arch bridges can first be dated back to as early as 1300 BC in Greece; however, they did gain popularity until the Roman Empire built over a thousand arch bridges across Europe, Asia, and North America. Arch bridges are defined as a bridge with abutments at each end shaped as a curved arch. This works by transferring the weight of the bridge into a horizontal thrust that is restrained by abutments at either side. Abutments are the substructures located at either end of a bridge that provide both vertical and lateral support where the structure contacts. Arch bridges maintained popularity until the industrial revolution, when more modern bridge designs became possible with the use of more advanced materials. However, with the help of modern materials, arch bridges built today can be built on a much larger scale in a variety of designs and styles. Diagonal span arch bridges, such as the Hulme Arch in Manchester, England, have a sleek captivating design that become iconic symbols in the cities in which they are located. They are both athstetically pleasing and versatile. Diagonal span arch bridges were co-developed with a university lab with both appearance and safety in mind. These bridges are relatively easy to assemble and install. The foundation of abutmenent is is applied with a reinforced concrete structure as well as C30 concrete. This ensures a solid foundation where the bridge’s superstructure rests. When the abutment and abutment pile caps are poured, effective measures are taken to lower the hydration heat. The abutment pile styled abutment, is based on a friction pile, this is built by the technique of hole drilling perfusion and hole digging. The diagonal arch is made with grade one steel. This style of bridge has obtained the construction design qualifications necessary to ensure quality and safety. In addition to their captivating appearance, diagonal span arch bridges have a variety of advantages. They are constructed using a special mode of steel that is of upstanding quality. They have an extremely high safety factor. Diagonal span arch bridges make the best use of space, allowing for an increase in storage capabilities. Shanghai Metal Corporation has overseas experience and resources second to none. They have 3,000 experienced employees ensuring an on-time delivery. 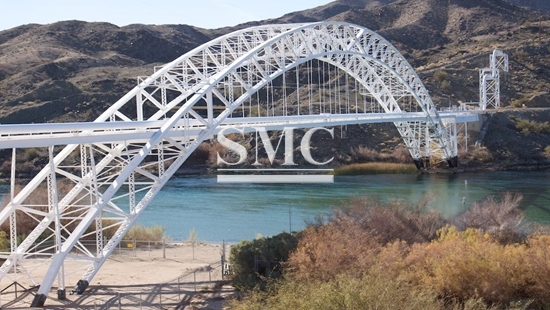 Diagonal span arch bridges can be customized to fit the individual needs and desires of each and every customer with a variety of purposes.